Use your computer to mark places using Google Maps, and you’ll see them on your smartphone! I love this feature of Google Maps – this is the appeal of ‘cloud computing.’ Use whatever device is most practical and see the results on any other device. Let’s say I’m researching where to stay as we travel from Fort Lauderdale to Bowling Green, Kentucky. I will use lots of different resources to do this: Streets and Trips with the POI Megafile is my first choice, then I’ll supplement that with websites for RV Park Reviews, Georgia State Parks, Passport America etc. Google Maps may or may not be part of the tools we use to find places to stay, but it’s definitely a good idea to mark the places once we’ve made our decisions. First, you need to go to the website for Google Maps – www.maps.google.com. Have you ever noticed the other button, beside ‘Get Directions’, for ‘My places’?’ That’s where you need to be in order to mark your special places. For this to work, you need to be logged in with a Google Account. If you’re not logged in, then clicking on ‘My Places’ will take you to a login screen – you can also create an account here if needed. If you are logged in, take a look in the upper right of your screen and check the account that is being used. Lots of people have more than one Google account, you need to be aware which account is being used when you create content like maps. I recommend watching the interactive tutorial the first time you visit here. 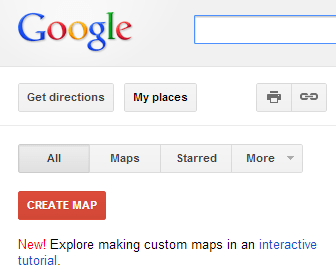 When you’re ready, click the red button for ‘Create Map’ and give it a Title. Let’s say you named it ‘Summer 2012 New England Trip’. Now use the Search field to look for the point you want to mark, e.g. Elks Lodge in Poughkeepsie, NY. When it has found the correct place, click on the marker to open up the dialog box and click the link to ‘Save to map.’ You’ll get a list of all your ‘My places’ maps. Choose Summer 2012 New England Trip, and click Save. You now have a saved marker for that place. 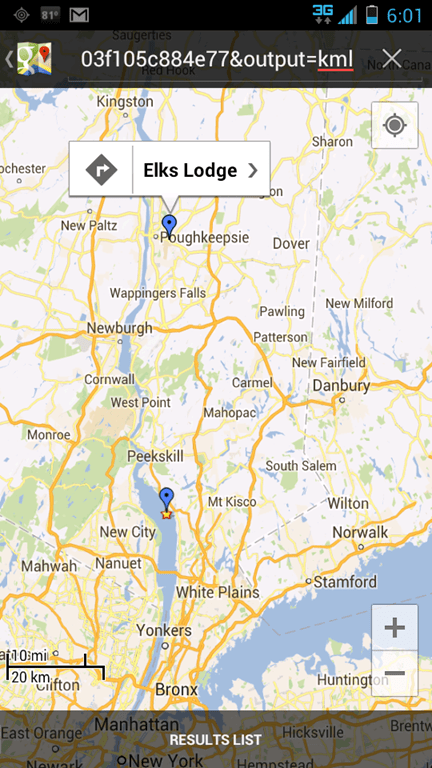 You should see a link pop up at the top of your map that tells you ‘Elks Lodge was saved to Summer 2012 New England Trip’ View Map. Click on view map to see the results of saving this place. Repeat this process for every place you want to add to the map. When you’re done, click the Done button. Here’s the real beauty … Google Maps, and ‘My Places’ can be viewed from any internet-connected device. On my Droid Razr phone, I just touch the Google Maps app. Once it’s open, you’ll see the icon for ‘Layers.’ Then choose ‘My Maps’ and then ‘Summer 2012 New England Trip.’ You will then see the same map markers on your smartphone as you did on your computer. Now you can click on the marker for the Elks Lodge, and choose Navigate to start Google navigation directions to that place. Ever since iOS 6, Google maps does not come as an app on your iPhone or iPad. Never fear, you can still get there by using your web browser. Just open Safari and go to www.maps.google.com be sure you are logged in to the appropriate Google account, then you can use the buttons in the upper right – the drop-down arrow will show you a menu. Choose My Places and then Summer 2012 New England Trip. What you will see at first is a text listing of all the marked places, but if you tap on a place you will see it displayed on a map. Once you get the hang of creating custom maps this way, there is a lot you can do with them. You can even share them from your computer by clicking the link icon and sending the URL to your friends. For more info, check out the videos on our Google Maps and Google Earth learning library page – you’ll need a Geeks on Tour membership to view most of them. Published by MrsGeek, in Blog. Tagged with Google Maps, My Maps, My Places. This is a great feature! Thanks for posting! I’m not sure if I should enter this comment here, but it is another Google Maps feature that I really enjoy using, and you don’t even have to be logged in. It’s the “send to GPS” from the “more” drop down menu, after you type in your destination.It then gives you options, “Send to:Email, Phone, Car, GPS”. You just type in your destinations on your PC, hook up your GPS via USB cable, and send them to your GPS. It’s a pain to me to poke all of that info into a GPS. Hope this is a helpful tip for those that don’t know. Hope you guys had a fantastic vacation in Cozumel!